The Brazilian community has reached three new milestones in its GLAM initiatives. Wikimedians during a backstage pass at Museu Paulista, on May 4. The Museu Paulista GLAM portal was launched in mid April and is now the main go-to reference for this initiative. The cover page provides an overview of the initiative, including media coverage. There are four pages that list the museum collection that is being uploaded to the projects. In the coming weeks, 3,000 more files will be uploaded to Commons. A page for members brings editors who have been involved with the GLAM initiative as well as an automated table to assess the quality and relevance of articles on Wikipedia in Portuguese associated to this GLAM initiative. There is also a page on off-wiki news, including conferences, talks, photo walks, education programs and so on. The upload of the collection of the University of São Paulo's Museum of Mathematics is done. This GLAM initiative has included producing the images (pictures and videos), the systematic improvement of content on Wikipedia in Portuguese, the development of a wikibook on mathematical knots, and a series of edit-a-thons. 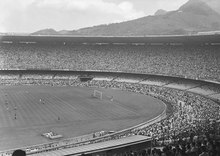 This picture of a soccer game in Brazil in the 1950s was the most viewed file from the National Archives collection in May, reaching over a million views. The GLAM initiative with the Brazilian National Archives has become the most widespread GLAM initiative in Brazil, reaching in May alone 16 million page views, according to the GLAMorgan report. Last uploads have included around 500 pictures of Brazilian politicians --most of them had Wikipedia entries but no image on them. Partners of these initiatives --besides the teams from these cultural institutions-- include NeuroMat, São Paulo Research Foundation, University of São Paulo, Faculdade Cásper Líbero, and Laramara. These initiatives were launched with the direct involvement of the Wikimedia Community User Group Brasil.